The Research Center for Micro-Functional Devices was established as a part of the Academic Frontier Promotion Program of the Ministry of Education, Culture, Sports and Technology (MEXT). From the year 2009, the Center was utilized as a joint research facility for various research projects. Currently, the Center supports research projects and develops activities relating to MEMS (Micro Electro Mechanical Systems) with ultra fine structure, and electronic devices and circuit system with high performances. The Center is equipped with a clean room of 200m2 . 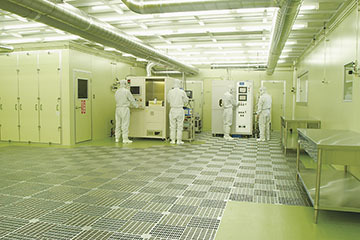 Apparatus for fine processing of silicon wafer is also provided inside the room, such as contact aligner, electron beam plotter, plasma etcher, and CVD unit among others. Currently, various research projects relating to micro machine, micro robot, high reliability device, AI device, quantum device, sensor and others are also undertaken in the Center.